My daughter is here visiting me before returning to school to finish her senior year of college. As usual, we have a great time together. We truly enjoy each other's company, and I am very grateful that we have the relationship that we do. I love her dearly and am very proud of the woman she is becoming. 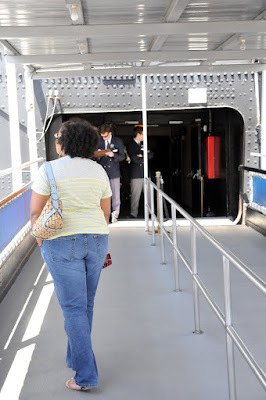 This is a picture of her going up to the Queen Mary where we were about to do the Ghost Tour and later a guided tour. It was actually a great deal of fun. She actually loves it out here in Los Angeles as I do, and will be moving here upon graduating from college next year. I am so looking forward to that, because I have missed her. I guess there will be no moving closer to Savannah for me.